There is a very interesting factoid that you guys must have heard- ‘The most innovations have come from military projects’. This is something true and also, quite intriguing. Another corollary that comes from this fact is that when you set out to discover or invent something, it is completely possible to find something else that might be even more useful if applied in a completely independent scenario. What I am coming to is how much Google glass is affecting Android without even coming to the market. The product itself is striking and if Google is able to place it correctly price wise, it would be very successful. In the meantime, to perfect it and its inability to use keyboard for input, Google has improved on its voice commands immensely and this is now showing in Android phones. Google Now and Google Search are becoming extremely efficient in both capturing the user’s accent and getting the things done without resorting to other input methods. 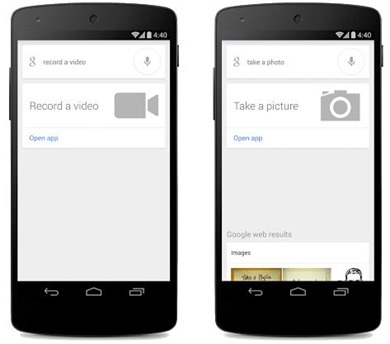 Now, Google has introduced two new voice actions that are straight from Google Glass- Image capture (“Take a Picture”) and Video Recording (“Record A Video”). With the help of these commands, one can directly start the camera app to take a picture or a video by Google search. In fact, in mobiles with always on “OK Google” like Moto X, one doesn’t even need to tap the search button. Simply say- “OK Google! Take a picture.” The camera app will open immediately and take the image. While this is arguable whether this actually saves time, there is no doubt that this is a nifty feature to have. In my Nexus 4, the camera app is one of the four static apps in the bottom. In addition, it can be swiped in directly from the lock screen. Therefore, for practical purpose, I still am not sure whether it will actually save time for me. Maybe using it might change my mind. In any case, the number of Voice Actions that Google is adding to its Search app is incredible and as Google’s research on Google Glass continues, we can expect many more nifty features coming into prominence and feedback received on Glass project will have lot to do with it! IRCTC Creates New Record With 5.8 Lakh E-Ticket Bookings In A Day!